This article is sponsored content brought to you by Ivoclar Vivadent. A 65-year-old male presented at the clinic with excessive mandibular periodontal disease, including mobility of the mandibular central incisors. An 8 cm x 9 cm CBCT scan was taken with the CS 8100 3D, which revealed advanced chronic periodontitis on the mandibular incisors. The scan clearly showed the residual bone volume around the teeth. The four anterior teeth could not be preserved. After a consultation, the patient accepted this treatment plan: stabilise the periodontal condition and then place two dental implants in the mandibular lateral incisal region and restore with a 4-unit bridge. To confirm the feasibility of the proposed treatment, implant planning was initiated by obtaining a CBCT scan on the patient to determine the relationship between the existing roots and the residual bone. The prosthetic plan was indicated by the opposite teeth visible on the CBCT scan. The virtual implants were placed in the 3D planning software and the emergence profile was validated. The decision was made to perform a freehand (non-guided) surgery because the existing sockets formed by the extracted and surrounding teeth would serve as the guide. The teeth were removed, a flap was elevated, and two implants were placed. Once multi-unit abutments were positioned, the scan bodies were placed on them. Before taking an impression, a rubber dam was used to mask the sockets of the extracted teeth and the blood in order to prevent the introduction of erroneous data in the impression. A digital impression was then obtained with the CS 3600 intraoral scanner and sent to the dental laboratory. Healing caps were placed on the implants until the delivery of the temporary restoration. A video conference was done with the dental lab to validate the design of the prosthesis in real time. Once validated, a PMMA (polymethyl methacrylate) bridge was milled. Less than two hours after sending the file to the lab, the temporary PMMA bridge was delivered. The bridge was placed within a few hours after the surgery with very little retouching required, thanks to the accuracy of the digital design. In this case, CBCT imaging enabled us to validate the diagnosis as well as identify the bone volume in relation to the prosthetic plan and implant axis. We were able to position the temporary PMMA bridge immediately, thanks to a fully digital workflow that combined the digital impression with in-lab CAD/CAM design and milling of the restoration. Carestream Dental’s 3D imaging software, including prosthetic-driven implant planning, is user friendly and intuitive, and is ideal for assessing treatment feasibility. 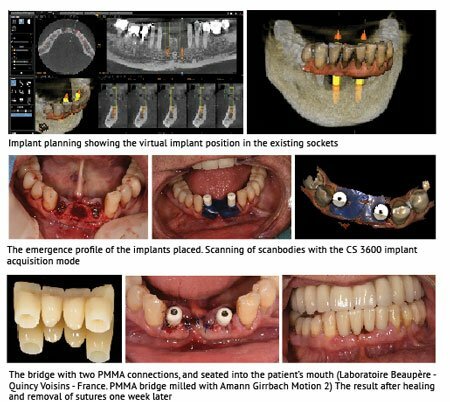 The ability to place virtual teeth in order to validate the prosthetic plan and implant axis is very compelling; it prevents the need to go through multiple cumbersome steps inherent in the traditional approach to implants. The time saved is significant. We can now immediately confirm whether or not treatment is feasible and move to surgery—often after the first appointment. 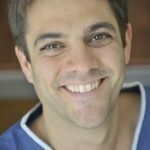 An implant specialist in Paris, Dr. Boutin is the coauthor of a publication about the anatomical risks of implant treatment, as well many publications about immediate loading protocols. He is a lecturer in multiple international courses and congress in anatomy, implant surgery and prosthesis.